Duo of the two outstanding characters of Hungarian folk and etnojazz. Even playing separately always results in an inventive music unveiling their stunning knowledge. Their musical relationship began ten years ago in Dresch Quartet. Their first duo concert was in 2010 at Fonó Music Hall. The special artistic and human correspondence in their play, the richness and variety of their music and the musical material has been burnishing in the last two years are all noticable on the new album. When it comes to listen the tracks – we got what is usual from them: endless musical richness and high art. On Labyrinth there are both own compositions and adaptations. Soundtrack contains pieces which are not in Dresch Quartet’s repertoire any more but the duo rethought them. 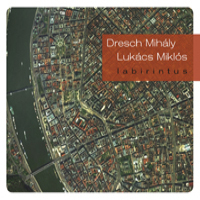 There are two Lukács compositions, Esteledő/Getting dark and the title song Labirintus/Labyrinth. Music comes from the reconciliation of the dulcimer and wind instrument. „Playing music is free, especially in a duo; we are able to create a wider universe. Style is not closed - those musical textures and materials which come from tradition became important to us.” – say the musicians.